Hyperaudio is a term coined by Henrik Moltke. After discovering we had similar interests we started working on the concept a while back, resulting in a few demos such as the Radiolab demo for WNYC. That was a couple of years ago now. Since then I have been working with my colleague Mark Panaghiston on various Hyperaudio demos and thinking about how we can create an suite of tools I imaginatively call the Hyperaudio Ecosystem, at the center of that ecosystem sits the Hyperaudio Pad. But hey, let’s back up a bit. What is this Hyperaudio of which I speak? Simply put, Hyperaudio aims to do for audio what hypertext did for text – that is to integrate audio fully into the web experience. I wrote more about that here. 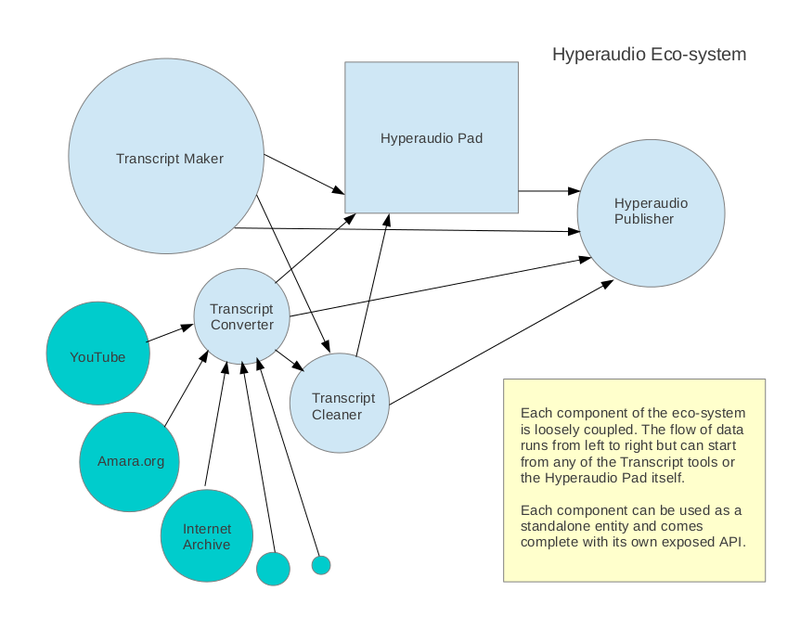 The Hyperaudio Pad is a tool that enables people to build up or remix audio and video using the underlying timed-transcripts. At the moment we’re concentrating on transcribing the spoken word. Over the last seven days or so me and the other Mark have been working fairly solidly on taking the Hyperaudio Pad to the next level. It’s great to work with Mark P for several reasons. Obviously as key author of jPlayer he knows pretty much all there is to know about web based media, but also although we are both developers we are in many ways diametrically opposed. Mark is keen on code quality and doing things properly and I just want to get things out there. Happily the compromise we arrive at when we work together is a usually a good one. Mark is coming around to minimal-viable solutions and I have to admit that doing things right can save time in the long-run. In fact there is a world of difference between earlier versions of the Hyperaudio Pad and that I largely developed and the version we have now after a week of collaboration. Putting our weird Renée and Renato relationship aside for a bit, let’s talk a little about what it is that the Hyperaudio Pad is actually meant to do. OK, so key aims here are really to encourage the remixing of media in a new and refreshingly easy way – in doing so promote media literacy. On the subject of remixing at its importance in counter-culture I’d encourage you to check out RIP! : A Remix Manifesto and the excellent Everything is a Remix series. Actually Brett Gaylor of Remix Manifesto fame is doing similar work by leading the effort building sequencing into Popcorn Maker. We’re approaching the same objective from completely different angles. Although we use the Popcorn.js library at the heart of the Hyperaudio Pad, we use text to describe and represent media content. This may seem counter intuitive but actually transcripts can be a great way to navigate media content. Transcripts help break media out of it’s black box and we can scan and search through it relatively quickly. The Hyperaudio Pad borrows from the word-processor paradigm allowing people to copy blocks of transcript and associated media and further, allowing them to describe transitions, effects, adjust volumes using natural language that resemble editing directions in a script. [fade through black over 2 seconds, apply effects nightvision, scanlines, tvglitch] currently works. but we want to encourage the user to be descriptive as these directions are both human and computer readable. Transcript snippets, combined with text described transitions and effects act as a kind of source code for the media. As cuts are nothing more than weak references to media files, start and end times and effects that are simply layered — in real-time — over the top, we can make additive remixes as easily as we can subtractive ones, that is to say, somebody could take a remix and enhance it by peeling back a specific snippet to reveal more, thereby adding to the piece. In fact a key goal here is to allow remixing of remixes. So a bit about more about the technology powering this. Effects are handled by Brian Chirls‘ seriously cool Seriously.js – a comprehensive video compositing library. The great thing about Seriously.js is that it is a modular system. We can add effects (and load their code dynamically) as we go. 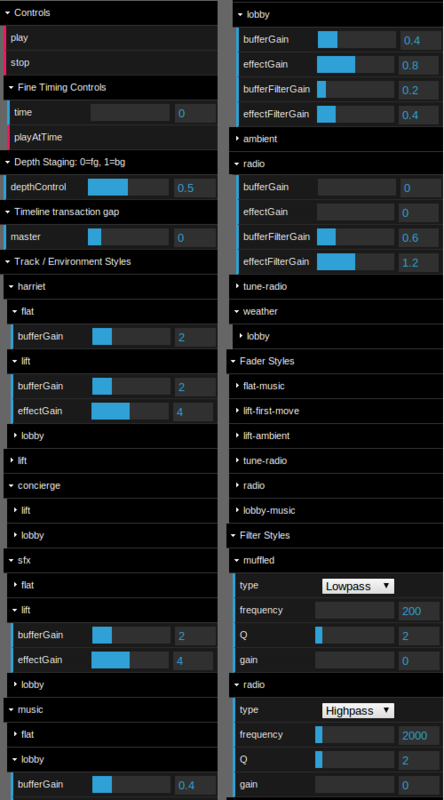 I also look forward to using some of our experience gained with the Web Audio API to apply realtime audio effects. The wider vision is to make a system that will take raw media, transcribe it and allow you to do all the things you could do with a professional video editing package. We’ve got plenty more to do, certainly some bugs to iron out, but we’re steadily approaching beta. A lot has been restructured behind the scenes, giving us a more stable platform to build on and more quickly enhance. The question I posed and answered on Twitter. What do you call something between alpha and beta? Alpha. - allow the playback and sharing of fullscreen video remixes with an option to see the underlying ‘source code’. If you want to play around yourself you can find the latest demo here. Or you can watch a screen recording of where we were at as of yesterday. Apologies for the choppy quality, oh and the background music, it seemed a good idea at the time. Back in the spring of 2012 we started working with the BBC on a project called Breaking Out, which was a short story that demonstrated the concept of Perceptive Media. With this article we want to look at the technical aspects in greater detail than our previous blog post on the subject. Sometimes when we take on projects we don’t really know what we’re letting ourselves in for. To fully know, we’d spec things out to the ninth degree and who wants to or has time for that? Well people like NASA do, but we don’t. When we were given the opportunity to work on something called Perceptive Media all I saw was a colourful but amorphous form ahead and although it was explained to me (as well it could be) I still didn’t have a real clue of what it would end up being and crucially what was involved in making it a reality. But hey it’s the BBC right? You don’t often get to work with the BBC – you know that BBC you spent so much time watching and listening to when you were growing up. The same BBC who make Doctor Who ? – That BBC! Time-lords aside (or not actually as the case may be), being a bit of an audio-geek I’ve always been fascinated by the BBC’s audio output especially their Radiophonic Workshop especially Delia Derbyshire’s work and this was an audio gig coming from the R&D department of the same organisation. How could we turn it down? So I jumped at the chance without really knowing what lay in store, which incidentally is very unfair on my colleague who ended up doing the lion’s share of the work. The brief went something like this : We want to create a web-audio based demo that will adjust its content to the listener, based on information we can ascertain about them. Oh and we want it to sound as natural as possible so that the listener may not suspect that the content is being tailored. I soon found out that this involved generating audio on-the-fly and applying convolution reverb and other effects so that audio sounded natural in various environments. What this all meant is that we needed to use an advanced audio API. Now I’ve had fun investigating advanced audio APIs before, they differ from the standard audio APIs by being designed to allow you not only to play audio files, but to generate and alter audio. This is exciting because we are finally getting around to doing stuff with audio that we have been doing with text for years. It also crosses over with something I’m looking at called Hyperaudio. The Speak.js demo pretty much demonstrates what it can do. You put text in and speech comes out. The library itself is ported from eSpeak using something called Emscripten and actually allows you to generate audio pretty much in real-time by constructing a data URI in WAV format. Unfortunately time and budget restrictions meant that we couldn’t create the version we wanted to make – a version that would work similarly in all browsers that provided an advanced audio API. As it seems that the future W3C standard for advanced audio will be based on the Web Audio API we decided to concentrate on that. The data we use to personalise the broadcast comes from a number of sources. The main differentiator is the listener’s location which we use via the geo-location API to determine, local weather, radio streams and landmarks which are then subtly inserted into the audio stream. The only restriction is that you must be in the UK to really encounter the differences – this is partly due to the fact that we use some BBC resources that are only available for the UK but also so that we can keep the data manageable for what, after all, is just a demo. The second source of information about the listener came from a slightly more sinister place. For fun I’d been working with a good friend of mine Matteo Spinelli on a project called Underpants and while looking at the issue of browser traceability across websites we figured out how to determine which social networks a browser is logged into. Cross-over struck once more and we used this technique to personalise the part where our outdoor-challenged hero is urged to log out of her favourite social network and leave the apartment. So what changes between the version of the broadcast that uses the Web Audio API and the fallback version that doesn’t? Well there are a number of factors, some of them quite subtle. 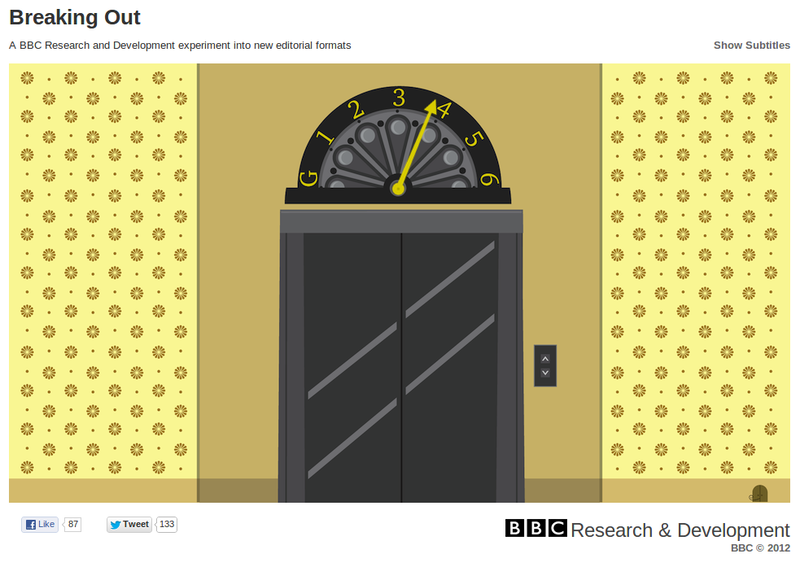 Speak.js outputs a robot style voice which is fine for our use as the electronic voice of the lift. But we wanted to make sure it would fit in properly to the various environments in which it was set. To do this we created something called a convolution-reverb. In short, a this reverb allows us to apply the right sort of audio ambiance to a sound. So if a sound is coming from a lift we apply a lift type echo. We also apply the same ‘echo’ to the streamed radio broadcast that is played at a certain point in the broadcast. The fact that we are using an advanced audio API also enables us to add various other effects to other pieces of audio. However we soon found that we needed to be sensible with our audio design, since convolutions with the Web Audio API does take a up a fair amount of CPU. During a development error, a unique convolution was used for each sound, this was found to start failing at around the 14th. 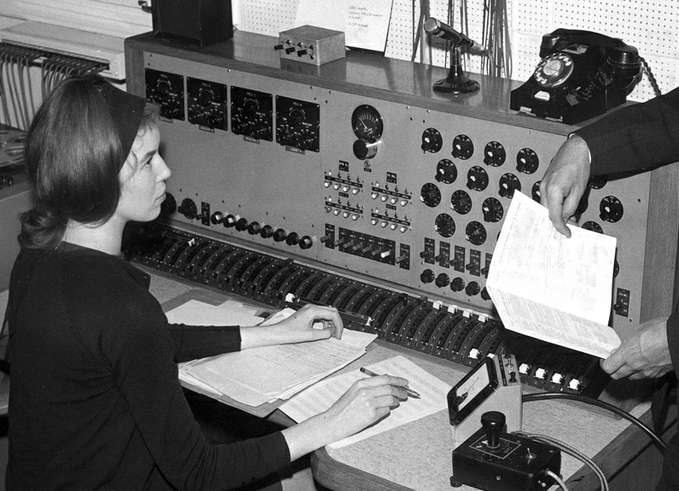 We also made use of audio filters, for example the radio podcast uses a high-pass filter applied to it which makes it sound ‘tinny’, another example is when Harriet opens the her apartment door at the start we apply both filters and faders. The Web Audio API uses a node based approach which means that you can feed the results of one effect into the next so we can apply filters, faders and convolutions to any audio source. To achieve all of this we made heavy use of Web Audio API’s AudioParam which allows nearly any attribute to be changed using handy linear transform effects – we used this to fade in and out, or cross-fade between filtered and unfiltered outputs. So the Web Audio API version applies filters, faders and convolutions to the audio whereas the standard HTML5 audio versions do not. That’s not to say that given enough time we couldn’t have achieved the same effect using the Audio Data API included in Firefox. But since the new audio standard is slated to be largely based on the Web Audio API it was decided for the purposes of this demo to concentrate our energy in this area. Once we’d got the core of the functionality working, we set to work on creating a control panel to allow us to tweak every single one of the volumes, filters, faders and convolutions. We wanted to be able to demonstrate to editors of audio how we could tweak pace, reverb and sound-effects in real-time and although requiring a complete code re-factor we hope that the fact that the whole thing is pretty-much customisable makes this a powerful demo and will be useful to others as well as ourselves who are dabbling in this area. So this is a good time to mention that all the source-code is open source and that you can grab it from the following GitHub location https://github.com/happyworm/PerceptiveMedia. I think this was definitely an interesting and worthwhile experiment. However as its aim was to be subtle, it purposely does not make immediately clear the potential of the technology. Technically what we are able to achieve turned out to be a kind of audio framework to allow the ability to create and tweak audio as it’s being played. This is useful to producers of audio to see how effects and timings can alter the experience and is especially useful for applications such as games where perhaps you want to give your sound-effects context. I also feel that these techniques could be used for applications such as dynamic story-telling. My daughter — all too often — asks me to tell her a story featuring robots, dinosaurs and goblins and all too often I fall back on the same old principles and formulas of children’s story-telling, the rule of three and so on. Post happy-ever-after she often wants me to add to the story, getting me to fill-in or clarify some of the details. It’s not a huge stretch to imagine that we could create dynamic storytelling applications for kids. A pinch of AI here, some personalisation there and a heavy dose of randomness might just be enough to keep them happy for a bit. So there we have it, one small step closer to the old Star Trek computer (Did Doctor Who’s have a voice interface? I forget). We’ve already seen the application of voice input with software such as Siri. It shouldn’t be too much longer until audio interfaces start to become common-place, with so much current emphasis on the visual I think this could be quite refreshing. Question. What’s harder to debug than an intermittent bug? Answer. An intermittent bug that only manifests itself when you deploy to the server. Crazy I know and totally unexpected to us and for this reason you may see issues when running on Firefox (but not Opera). Being supporters of both Mozilla and Firefox we were much dismayed by this bug and spent a significant amount of time trying to get to the bottom of it. Unfortunately due to its nature we were only able to put in a loose bug-report If anybody wants to help us solve this issue please feel free to take a look, even if it’s just to download the application from GitHub and verify that it works locally for you. Thanks then to Ian Forrester and Tony Churnside for the opportunity to work with them and their team at BBC R&D, also of course Sarah Glenister for the excellent script and Angie Chan for the great artwork. Jussi Kalliokoski for helping us work with AudioLib.js But most of all I want to thank my colleague Mark Panaghiston for working tirelessly behind the scenes not only on the significantly challenging audio aspects of the project but also go above and beyond in integrating the visual aspects and even sourcing and setting up the hosting. HTML5 Audio APIs – How Low can we Go?